We look at a lot of different cookbooks. No surprise, over the past couple of years we’ve seen a number of cookbooks riding the cupcake wave. 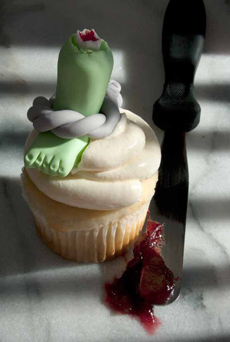 The most memorable is Zombie Cupcakes: From the Grave to the Table with 16 Cupcake Corpses, by Zilly Rosen, a professional cake designer based in Buffalo, New York. Each recipe has a color photo of a stunning zombie-inspired design. In addition to the undead, concepts include crows tearing up the icing to reveal “blood” underneath, and a graveyard with rats. The photos make us want to start a zombie cupcake bakery and turn out these delights every day. But even if we never bake a thing, we like Zombie Cupcakes as a fantasy picture book that makes us smile. Ms. Rosen: How are you going to top this? Beyond us grown-ups, we think the book represents a great opportunity to teach kids and teens the joy of baking. Photo © Ivy Press 2010. Styling by James Lawrence. Anyone can get a box of cake mix and a can of stuffing to produce ordinary cupcakes. With Zombie Cupcakes, you can work your way up to being a cupcake star. Fondant is the key. Fondant is a smooth paste made of sugar, glycerine and cornstarch. It is rolled like dough to a 1/8″ – 1/16″ thickness and then draped over a cake instead of a traditional frosting. It can be flavored. To decorate, shapes can be molded, then colored, and painted. Think of it as edible Play-Doh or modeling clay. Fondant also seals in moistness, enabling cakes and cupcakes to stay fresher longer than with conventional types of frosting. That’s why it’s so often used on wedding cakes, which can take a couple of days to build and decorate. If you’ve seen cakes that look like handbags, wrapped gift boxes, race cars, etc. : that’s fondant (check out these fondant-covered cakes from Elegant Cheesecakes). You don’t have to make fondant from scratch: It can be purchased at a baking supply store. Having said that, we must underscore that fresh, homemade fondant tends to taste better—like marshmallow. If you need more hands-on instruction than the book provides, you should be able to find a “Working With Fondant” course at a local baking supplies store or cooking school. Start now, and by Halloween your fondant skills should be party-perfect—or at least, good enough to raise the dead. Watch out: We’ll be back for Halloween with the crows and the graveyard.